Eli Lilly is the 10th largest pharmaceutical company in the world. The company markets its medicines and treatments in 143 countries, has major research and development facilities in eight countries and conducts clinical trials in more than 50 countries. Media Wise was asked to provide public relations support for the visit to the Netherlands of Eli Lilly & Company Chairman, President and Chief Executive Officer John Lechleiter. The CEO’s main objective was to visit Eli Lilly Netherlands for a staff meeting. It was decided it would also be a good opportunity for Mr Lechleiter to meet the Dutch press and to introduce the recently appointed Manager of Lilly Netherlands, Andrew Oxtoby, to an external audience. Working closely with Lilly EMS (European Mid Size Affiliates – incl Lilly Netherlands) Communications Manager, it was agreed that a select number of targeted journalists would be offered an audience with Mr Lechleiter and Mr Oxtoby, and that these journalists would have the opportunity to attend a short press briefing followed by a series of one-to-one interviews. The angle of the pitch to these journalists was important. Media Wise focused on the fact that John Lechleiter was in the Netherlands to talk about innovation in the pharmaceutical industry and to offer his vision for the future. This topic was of particular interest to the journalists, given the recent announcement of the planned closure of an important Dutch R&D centre in the south of the country, with resulting loss of approximately 2,000 jobs. The journalists were keen to gain an insight into Eli Lilly’s global strategy and to hear Mr Lechleiter’s own views on the industry’s development. Correspondents from top national newspapers and news agencies, Het Financieele Dagblad, De Volkskrant, De Telegraaf, Bloomberg, Reuters and Dow Jones were quick to RSVP and all attended the briefing. Comprehensive briefing notes and key messages were then prepared to ensure that Mr Lechleiter had all the necessary, Netherlands-related information to hand so as to be able to satisfy all requests from the press. Extensive coverage was achieved following the press briefing, with comprehensive write-ups appearing in the national newspapers the next day. The story played prominently on the front page of De Financiële Telegraaf (the largest circulation Dutch daily) and Het Financieele Dagblad ran their story on the front page of the business section. 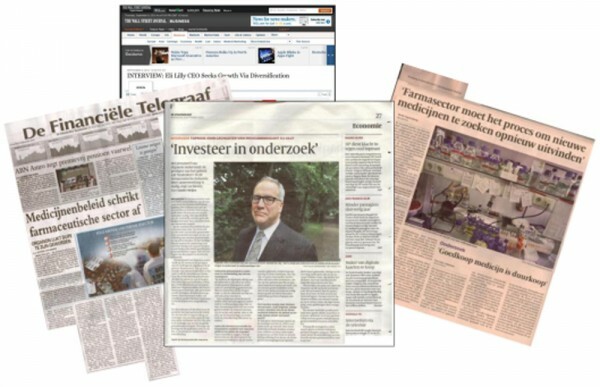 De Volkskrant ran its story in its economic news section, along with a photo of John Lechleiter taken by their own photographer. Dow Jones, Bloomberg and Reuters all wrote up their angles on the press briefing and articles citing the them as their source also appeared in the Wall Street Journal, the Indystar online and Fierce Pharma.